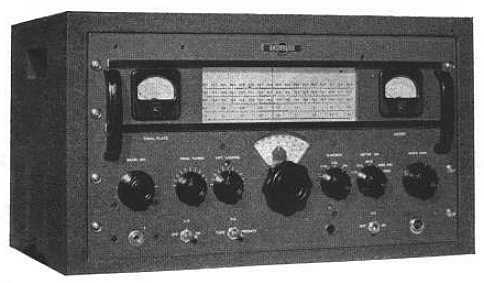 The 32V-3 transmitter is VFO controlled and features bandswitching on all amateur bands between 3.5 and 29.7 megacycles. The rated plate input power is 120 watts phone and 150 watts CW. Shielding and filtering are employed to minimize the possibility of television interference. All wiring is independent of the cabinet, and the complete unit may be removed from the cabinet for inspection or maintenance. Complete coverage of the 80, 40, 20, 15, 11 and 10 meter bands is obtained with the 32V-3. Quick band-change on all stages is accomplished by bandswitching. 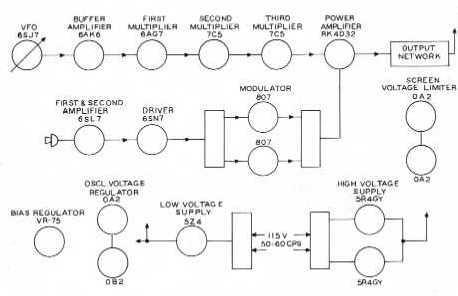 Tuning controls of the permeability tuned circuits of the 1st, 2nd, and 3rd multipliers are ganged with the oscillator. The final tank consists of impedance matching network with two separate controls located on the front panel, one for tuning and one for loading. A type 4D32 tetrode power amplifier tube is used in the PA stage. The plate circuit is tuned by a combination pi-network and "L" network which is band switched along with the multiplier stages. This network reduces the output impedance to around 50 ohms on all bands by means of inductance and capacitance switching. The output network can match antenna impedances in the range of 26 to 600 ohms. Two heavy duty toggle switches control the low voltage and high voltage circuits. The switches are arranged so that the high voltage cannot be applied until the low voltage circuits have been energized. 115 volts AC, 50/60 cps, single phase. The maximum overall input power requirement is 500 watts at 90% power factor. The nominal rated power input of the 32V-3 is 120 watts on phone and 150 watts CW. Audio distortion is less than 8% at 90% modulation with a 1000 cps input frequency. Within 2 db from 200-3000 cps. 12 1/4 in. high, 21 1/8 in. wide, 13 13/16 in. deep. Copyright © 1997 W5AM. All rights reserved.